Vestments are liturgical garments and articles associated primarily with the Christian religion, especially among the Eastern Orthodox, Catholics (Latin Church and others), Anglicans, and Lutherans. Many other groups also make use of liturgical garments; this was a point of controversy in the Protestant Reformation and sometimes since, in particular during the Ritualist controversies in England in the 19th century. For other garments worn by clergy, see also clerical clothing. In the early Christian churches, officers and leaders, like their congregations, wore the normal dress of civil life in the Greco-Roman world, although with an expectation that the clothing should be clean and pure during holy observances. From the 4th century onward, however, modifications began to be made to the form of the garments, and as secular fashions changed from the 6th century the church retained the original forms of their garments, although with separate development and with regional variations. The Catholic churches had essentially established their final forms in the 13th century. The Reformation brought about a new approach towards simplicity, especially under the influence of Calvinism. The Church of England experienced its own controversies over the proper use of vestments. The resulting varieties of liturgical dress are described below. The rubrics (regulations) for the type of vestments to be worn vary between the various communions and denominations. In some, clergy are directed to wear special clerical clothing in public at all, most, or some times. This generally consists of a clerical collar, clergy shirt, and (on certain occasions) a cassock. In the case of members of religious orders, non-liturgical wear includes a religious habit. This ordinary wear does not constitute liturgical vestment, but simply acts as a means of identifying the wearer as a member of the clergy or a religious order. A distinction is often made between the type of vestment worn for Holy Eucharist or Holy Communion and that worn for other services. Non-Eucharistic vestments are typically referred to as "choir dress" or "choir habit" in the Roman Catholic, Orthodox, and Anglican churches, because they are worn for the chanting of the Daily Office, which, in the West, takes place in the choir rather than the sanctuary. In other traditions, there is no specific name for this attire, although it often takes the form of a Geneva gown worn with or without preaching bands and a stole or preaching scarf. In the more ancient traditions, each vestment—or at least the stole—will have a cross on it, which the clergy kiss before putting it on. A number of churches also have special vesting prayers which are recited before putting each vestment on, especially the Eucharistic vestments. For the Eucharist, each vestment symbolizes a spiritual dimension of the priesthood, with roots in the very origins of the Church. In some measure these vestments harken to the Roman roots of the Western Church. Use of the following vestments varies. Some are used by all Western Christians in liturgical traditions. Many are used only in the Roman Catholic and Anglican churches, and there is much variation within each of those churches. an item of clerical clothing; a long, close-fitting, ankle-length robe worn by clerics of the Catholic, Eastern Orthodox, Anglican, Lutheran and some Reformed churches. The long, narrow strip of cloth draped around the neck, a vestment of distinction, a symbol of ordination. Deacons wear it draped across the left shoulder diagonally across the body to the right hip while priests and bishops wear it draped around the back of the neck. It may be crossed in the front and secured with the cincture. Traditionally, this was done by priests when wearing Eucharistic vestments, whereas bishops always wore it uncrossed (as possessing the fullness of the priesthood). Modern usage is for both bishops and priests to wear the stole uncrossed. Corresponds to the Orthodox orarion and epitrachelion (see below). The common garment of any ministers at the eucharist, worn over a cassock. Most closely corresponds to the Orthodox sticharion (see below). Symbolizes baptismal garment. See also cassock-alb. or cassalb is a relatively modern garment and is a combination of the traditional cassock and alb. It developed as a convenient undergarment (or alternative to a cassock at the Eucharist) worn by clergy and as an alternative to the alb for deacons and acolytes. A large cross worn on a chain or necklace around the neck by clergy of many Christian denominations. In some traditions it is associated with bishops. In the Roman Catholic tradition it is only worn by bishops, abbots, and certain canons who are granted the use of the pectoral cross by special indult. In choir dress the cross is gold with a green rope, red for cardinals. In house dress, it is silver with a silver chain. A white tunic worn over a cassock or habit. It is commonly worn by altar servers, choir members and also in Catholic and high church Anglicanism it may be worn by clergy who are attending a eucharist but not the celebrant. Among lower church Anglicans and some Lutherans and Methodists the Surplice is sometimes worn with a stole or scarf (and less often by itself) as the proper vestment for the Eucharist. A circular cape reaching to the ankle, commonly used by bishops and priests and, sometimes, also by deacons. In traditions that historically reject the use of the Chasuble the Cope may be used as a Eucharistic vestment. Similar to a surplice but with narrower sleeves. In Catholic and Anglo-Catholic use it is often highly decorated with lace. The Anglican version is bound at the cuffs with a band of cloth and worn with a chimere. Its use is reserved to bishops and certain canons. A skull cap, similar to the Jewish kippah. Commonly worn by bishops (including cardinals and the Pope) and less commonly by other clergy. Worn by bishops and some abbots. Despite the having the same name, this does not really correspond with the Eastern mitre (see below), which has a distinct history and which was adopted much later. A liturgical handkerchief bound about the wrist, it is only used during the Mass. The maniple fell out of common use with the 1970 post conciliar liturgical reform, but is gaining in popularity in many circles and is used today in the context of the Tridentine Mass, in which it is required by rubrics, and in some Anglo-Catholic and other parishes. According to some authorities, this corresponds to the Orthodox epigonation (see below). Long cloth rectangle draped around the shoulders and used to cover the hands of the priest when carrying the monstrance. It is also worn by the subdeacon when holding the paten. A rectangular cap that may be worn by clergy of all ranks except the Pope; its color can signify rank. The outermost garment of subdeacons. The outermost sacramental garment of priests and bishops, often quite decorated. It is only worn for the celebration of the Eucharist. Corresponds to the Orthodox phelonion (see below). See also chasuble-alb. The outermost garment of deacons. a cloth around the neck used to cover the collar of street attire. It is worn by the celebrant, deacon, and subdeacon for the Mass. or Girdle. It is a long woven cord used to cinch the alb at the waist, and to contain the stole as it hangs down the body. Corresponds to the Orthodox zone. A narrow band of lamb's wool decorated with six black crosses, worn about the neck with short pendants front and back, worn by the Pope and bestowed by him to Metropolitan bishops and Archbishops. Corresponds to the Orthodox omophorion (see below). An episcopal humeral worn over the chasuble. It is only used by the Bishops of Eichstätt, Paderborn, Toul, and Cracow (Kraków). Until the 17th century, it was also in use in the Bishopric of Regensburg (Ratisbon). The liturgical gloves worn by a bishop celebrating a Pontifical Solemn Mass. They are usually seen today only within the context of the Tridentine Mass. The liturgical sandals worn by a bishop celebrating a Pontifical Solemn Mass. They are usually covered by the liturgical stockings, which are of the liturgical color of the Mass. They are usually seen today only within the context of the Tridentine Mass. A double-layered mozzetta, now only occasionally worn by the Pope during solemn Pontifical High Masses. Formerly worn by the Pope at his coronation and at other key moments; it has fallen out of use but may be revived at any time if the reigning Pontiff wishes. Apart from the coronation, this was only worn on special occasions such as during Ex Cathedra announcements, some solemn processions and the blessing Urbi et Orbi. A vestment similar to a broad maniple but worn suspended from the right side of the cincture, decorated with a cross on one end and an agnus dei on the other; worn only by the Pope during a Pontifical High Mass. A vestment that forms a long skirt extending from under the hem of the alb; worn only by the Pope during a Pontifical High Mass and draped over the Pope's body at a Papal Funeral. 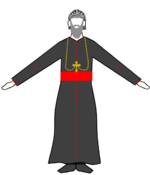 Red or black outer garment of bishops. Resembles a knee-length open-front waist coat. Covering of the lower leg worn by archdeacons and bishop. Black, buttoned up the sides and worn to just below the knee. Largely obsolete. (or preaching scarf). A black scarf worn by bishops, priests and deacons in Anglican churches. It is worn in the same fashion as a stole, but does not have the same significance. Dissenting ministers also historically wore these and, though now rare, it is re-emerging in some Presbyterian and Baptist circles. A blue tippet is also used in Anglican churches by readers, which are members of the laity who have been given special license from the bishop to lead non-sacramental services in the absence of an ordained person. The blue colour differentiates readers from clergy. Also known as the "Geneva Gown", this is a simple vestment with open, wide and bell-shaped sleeves. The gown is traditionally worn open (or vented) over a cassock, with preaching bands and an academic hood. Historically, Anglican clergy would remove their surplice and put on a black gown for the preaching, though this practice is rare today. Also, along with preaching bands, it formed the typical daily dress of Anglican clergy from the Reformation until the early 19th century. English Dissenting churches (Presbyterians, Congregationalists and Baptists) preferred to wear the gown alone with the cassock and bands at all times, most being wary of the surplice (a remnant of the "Surplice War" cause by the reforms enacted by Archbishop William Laud, referred to as "Laudianism"). Hoods, which denote the highest academic degree of their wearers, are usually worn by Anglican clergy at choir offices. It is also sometimes worn by Methodists and Reformed/Presbyterian clergy with an academic gown ("Geneva Gown"), though this is fairly rare in the United States. a type of neckwear taking the form of two oblong pieces of white cloth which is tied about the neck so to hang from the collar. Sometimes referred to as "preaching bands", they are worn traditionally by most of the Anglican, Lutheran and Methodist clergy with a cassock (with or without a surplice) or gown. 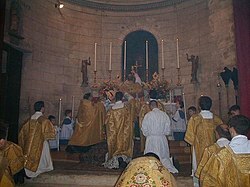 Among the Paleo-Orthodoxy and Emerging Church movements in Protestant and evangelical churches, which includes many Methodists and Presbyterians, clergy are moving away from the traditional black Geneva gown and reclaiming not only the more ancient Eucharist vestments of alb and chasuble, but also cassock and surplice (typically a full length Old English style surplice which resembles the Celtic alb, an ungirdled liturgical tunic of the old Gallican Rite). Icon of St. Gregory the Illuminator wearing the omophorion, a type of phelonion worn by bishops called the polystavrion, epigonation, epitrachelion and sticharion (fourteenth century fresco, Mistras). 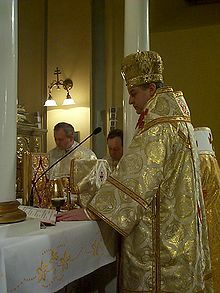 Eastern Catholic bishop wearing a sakkos, omophorion, and mitre (Prešov, Slovakia). Archbishop John (Maximovich) wearing an episcopal mantle. In the Eastern Orthodox Church and Eastern Catholic Churches, any member of the clergy of whatever rank, will be vested when serving his particular function during the Divine Liturgy or other service. As in the Latin Church, the use of vestments is rooted in the early history of the church. The various vestments serve several different functions. The three forms of stole (Orarion, Epitrachelion, and Omophorion) are marks of rank. 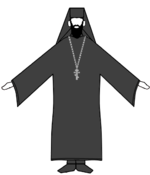 The three outer garments (Sticharion, Phelonion, and Sakkos) serve to distinguish the clergy from the laity. Some are practical (Zone and Epimanikia), holding the other vestments in place. Some (Nabedrennik and Epigonation) are awards of distinction. My soul will rejoice in the Lord, for he has clothed me with a garment of salvation and wrapped me in a robe of gladness; he has placed a crown on my head as on a bridegroom, and adorned me with beauty as a bride. Actually a form of the garment worn at baptism, this is the one vestment worn by all clergy. It is also used by non-ordained persons carrying out a liturgical function, such as altar servers. For priests and bishops, it is made of lightweight material, usually white. It corresponds most closely with the Western alb (see above). A long narrow strip of cloth worn by deacons over the left shoulder and reaching to the ankle in both front and back. It is also worn by subdeacons and, in some places of the Greek tradition, by tonsured altar servers. It corresponds to the Western stole (see above). This stole is worn by priests and bishops as the symbol of their priesthood. It is worn around the neck with the two adjacent sides sewn or buttoned together, leaving enough space through which to place the head. It corresponds to the Western stole (see above). Cloth belt worn by priests and bishops over the epitrachelion. Corresponds to the Western cincture (see above). Large conical sleeveless garment worn by priests over all other vestments, with the front largely cut away to free the hands. Byzantine rite Bishops may also wear the phelonion when not serving according to hierarchical rubrics. Corresponds to the Western chasuble (see above). Instead of the phelonion, the bishop usually wears the sakkos or Imperial dalmatic. This is a tunic reaching below the knees with wide sleeves and a distinctive pattern of trim. It is always buttoned up the sides. A square or rectangular cloth suspended on the right side by two adjacent corners from a strap drawn over the left shoulder. This is a relatively recent Russian invention and is not used in the Greek tradition. It is an award, so it is not worn by all priests. Bishops do not wear it. A stiff diamond-shaped cloth that hangs on the right side of the body; it is suspended by one corner from a strap drawn over the left shoulder. It is worn by all bishops and as an award for priests. This is the distinctive episcopal vestment, a wide cloth band draped about the shoulders in a characteristic manner. It corresponds to the Western pallium (see above). The Byzantine Orthodox mitre is modeled on the ancient Byzantine imperial crown; it is worn by all bishops and in some Slavic traditions also awarded to some high-ranking priests. The bishop's mitre is surmounted by a cross, but the priest's is not; both are bulbous and adorned with icons. Coptic Orthodox & Ethiopian Orthodox bishops also wear the Byzantine mitre. Armenian Orthodox, on the other hand, have the Byzantine mitre as part of the normal vestments worn by priests of all ranks, and their bishops are distinguished by wearing mitres after the western shape. Mitres are not worn in the Syriac Orthodox tradition, where a decorated hood like an amice called masnaphto, meaning 'turban', is worn instead by prelates. A large cross is worn around the neck by all bishops, but not necessarily by all priests. In Russian usage, the style of Pectoral cross worn indicates the rank of the priest. Engolpion (Greek ἐγκόλπιον) is a general term for something worn upon the bosom; here, it refers to a medallion with an icon in the center. A Panagia (Greek Παναγία, All-holy, one of the titles of the Theotokos) is an engolpion with Mary as the subject of the icon; this is worn by all bishops. All primates and some bishops below primatial rank have the dignity of a second engolpion, which usually depicts Christ. This is a sleeveless cape that fastens at the neck and the feet, worn by all monks. The usual monastic mantle is black; that worn by the bishop as he enters the church for a service but before he is vested is more elaborately colored and decorated. This is, strictly speaking, an item of street wear, not a vestment; however, in modern usage it is worn only in church. Despite their often elaborate design, the vestments are generally intended to focus attention on God, and the office of the person wearing them, rather than on the person himself. It is partly for this reason that a Russian phelonion is designed with a very high back, so that when the priest is standing facing the altar his head is almost completely hidden. Other items, such as the epimanikia or cuffs, represent manacles or chains, reminding the wearer and others that their office is a position of service. Within the Oriental Orthodox and Oriental Catholics there is much variance as to what vestments are used. In these Churches, general only a white robe will be used for the Eucharistic service. On more solemn occasions, an epitrachelion-like vestment is worn, and sometimes a vestment resembling a cope is worn. Priests and Bishops always carry a Hand Cross during services. Deacons wear either a orarion crossed over the left shoulder, or brought around the back (where the two pieces form a cross) and then hanging down in front (not crossed), secured by the cross piece. This is a broad stiff band of heavily embroidered brocade and decoration, functioning like a collar, worn exclusively by Armenian Orthodox priests over the phelonion. It corresponds to, and is likely derived from, the Western amice. Phillips, Walter Alison (1911). "Vestments" . In Chisholm, Hugh. Encyclopædia Britannica. 27 (11th ed.). Cambridge University Press. pp. 1056–1062. Dwyer-McNulty, Sally (2014). Common Threads: A Cultural History of Clothing in American Catholicism. The University of North Carolina Press. ISBN 978-1469614090. Look up vestment in Wiktionary, the free dictionary. Wikimedia Commons has media related to Christian ceremonial clothing.